I had to put Pinoy in front of the barbecue, which is a very common word, to make it utterly Pinoy. The word Pinoy is a slang of Filipino. Though it is a street word, it is never taken in a derogatory manner. Rather, it is a proud name for the common Filipino. Now before I go on a lecture of Nationalism and more, I shall go back to food. Barbecue is technically the act of cooking. But when you say barbecue here, devoid of other descriptive words like chicken, pork belly, etc., it means marinated meat on skewers, grilled to perfection. And I love this kind of barbecue, even if I hate sweet food. This is sweet, like most Filipino food are (unless they are really sour). The ease of eating it, and how it is easily sold on the streets (not that I was allowed to) makes it such a common food. But of course, we all know how these different stalls have their own special recipe and dipping sauce. I, on the other hand, have a tried and true recipe. It’s not a secret. Hardly. But the few ingredients go well together and we have never failed with it. Mix the soy sauce, ketchup (yeah, whatev the spelling), sugar, calamansi juice, and garlic. Taste. It is what your meat will taste like. Add salt and pepper. Mix in the pork in the marinade, and leave overnight, or at least for three hours. Soak the barbecue sticks (skewers) in water. 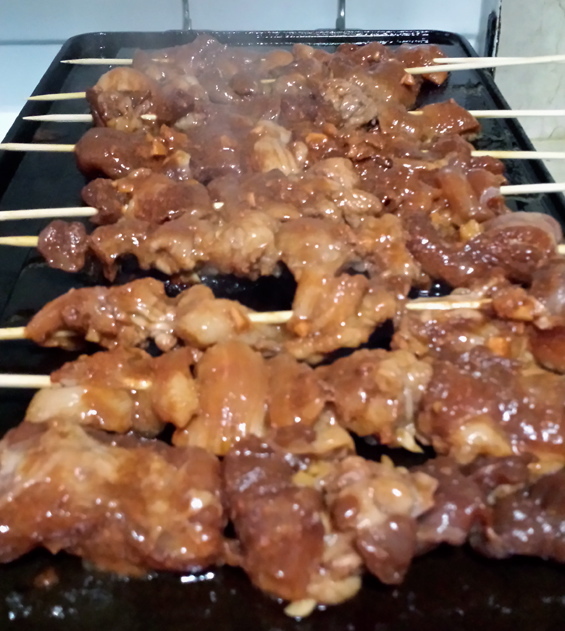 Place the meat on the stick (see picture). Using the leftover marinade, cook this and add more banana catsup and soy sauce. Then add a bit of oil. Taste after cooking, which is a thorough boil. This will be your basting medium. PS. Can you use tomato ketchup? For sure. It will be less sweet. So either be happy with it or add more sugar.